I promised my son and his new wife a quilt for their wedding. 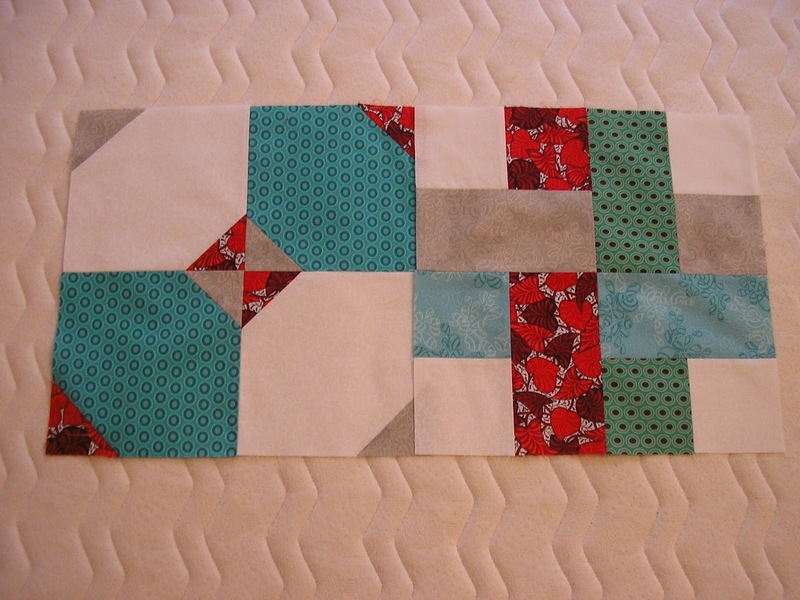 In actual fact, I promised them a Double Wedding Ring quilt, how ambitious/over-optimistic was that? Well they were married in February last year and the Double Wedding Ring templates are still firmly in their packaging! Having only ever made 2 bed-size and 2 lap quilts before what on earth made me think that I could make a Double Wedding Ring quilt in 6 months?? Blind optimism or staggering naivety, you tell me. As the 2 bed size quilts already made have gone to his brothers , the son recipient of the Double Wedding Ring quilt has not been slow to remind me of my rash promise when the opportunity arises. So in an attempt to regain some credibility with aforementioned son I have signed up for Sew Happy Geek's quilt along. Not quite a DWR quilt I know but a quilt nevertheless and one that involves the very scary technique of paper-piecing (!) so not without its challenges. Two weeks and 4 blocks into the QAL and I am thoroughly enjoying myself thanks Sew Happy Geek!